Choma’d opening back in January 2017 behind the Haute Baso clothing and design shop in Nyarutarama. It replaced J. Lynn’s (who moved to Kagugu) and did a major renovation, opening the airy space up to the yard in the back (and the great view) and creating a very cool new space for Kigali residents to enjoy. As the name suggests, this place does meat! They have a nice menu with a variety of meaty dishes on offer as well as a full bar and a pretty nice atmosphere, both day and night. As for the meat, their pork ribs (half rack 5,500, full rack 9,000) are tasty but if you’re used to saucy ribs, this is something different. The Choma’d ribs have more of a dry rub on them that’s very flavourful and I really enjoyed them. Different from what I’m used to, but good! The chicken here (Rwf 5,500 for a quarter, Rwf 18,000 for a full bird) is juicy and deliciously seasoned. Plus their coleslaw is really good. The sweet potato fries are a nice option and they’re very generous with the mayonnaise and have a couple of good hot sauces to allow me to mix up the mayo/pili pili dipping sauce I love so much. Plus they do a beef burger (Rwf 5,000), a fillet steak (Rwf 8,000), and a cheese steak sandwich (Rwf 5,500) to satisfy all of your meaty needs (they all come with a side). Perhaps it’s a bit weird that they don’t serve goat nyama choma, based on their name, but what they do have is quite delicious so lets just look past that. As far as I know from my extensive travels around Kigali’s food world, Choma’d is the only place you can find macaroni and cheese. Their Mac n’ Cheese bowl (Rwf 4,000 or Rwf 1,500 as a side) is a perfect rainy day plate of comfort food. Cheesy with a nice accent of pepper… I’m a fan! One thing that I think sets Choma’d apart a bit and makes it a great place to come with a group of friends are their platter options. The weird thing is that you can order a small platter for Rwf 12,500 that consists of food that adds up to Rwf 12,000 in price if you order it separately. So, while the thought is there and the idea is good, something went a bit wrong at the arithmetic stage. While I have sampled a very delicious strawberry mojito (lunchtime drinking… it’s my thing), I haven’t yet ventured to Choma’d in the evening. But I have it on good authority that it’s a happening night spot. They have a great menu of nine creative cocktails (Rwf 8,000) served in mason jars and they’re one of the few places in Kigali that has a menu for shooters (Rwf 4,000). 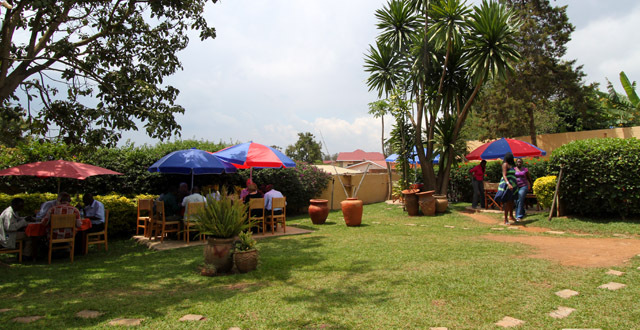 Choma’d seems to be a popular hang out spots for young, trendy, Rwandans. But not too young! They have a 21-and-over policy, which is something I haven’t seen at other bars but it’s a nice touch, especially for the oldies among us. They’re serious about their booze, it would seem. 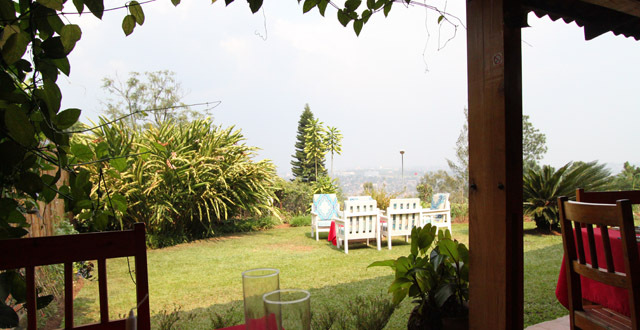 They run a happy hour every day from 4 to 6pm on cocktails with a Rwf 2,000 discount which seems like a great way to start a night out in Kigali. Plus they have a full menu of beer, a few wine choices, and lots of spirits. If you’re up for a big night, they offer bottle service (from Rwf 20,000 for a glorious bottle of Waragi up to Rwf 110,000 for a 15 year Glenfiddich for those classy folks). I completely love the thought that seems to have gone into this place. I love the idea for having the long communal tables. It’s something that nowhere in Kigali (that I know of) has done and I’ve always really liked restaurants with this sort of setup. The table with the pole going straight through the bench is a bit of an odd location choice, but as a whole the idea works really well, I think. I also like the extra effort taken to add their own ‘plates’ by making wooden boxes with ‘Choma’d’ painted onto the side. I think they look great and it’s those extra touches that add to a nice overall experience. The large boxes sort of make the servings seem small because of all of the extra space, but I left full so I guess it was just an optical illusion. Choma’d is just plain cool. It takes advantage of a beautiful view and has a great ‘outside’ feel while still being under cover. The music is good, servers are friendly, and I really like the food. It’s an awesome place to start a night out in Kigali (especially with the happy hour and tasty cocktails) and it even seems to be an evening destination in itself. Be aware, though, that it can get a bit loud in the evenings so it might not be the best choice for a quiet dinner out. I’m a fan. Check it out and let us all know what you think in the comments!